One of the key differentiators PICS offers is the Dedicated Teams concept. We start with a “cycled” approach to inventory scheduling—one store per day, spread over several days per week, throughout the year. 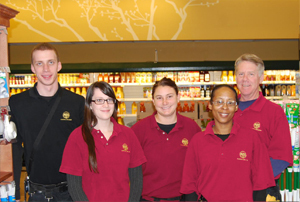 Then we send the same core team of auditors to each store within a chain to conduct the inventory counts. Why is this so important? They know when to get there, where to go, what to do, how to do it. Their accuracy increases, their efficiency increases, and the stores get better inventory counts. Call us at 888-303-8482 or send us an email for more information. 1. the combined action of a group of people, esp. when effective and efficient. Teamwork is also defined as the ability to comprehend and recognize the diverse strengths and abilities within a group setting and then apply them to one final solution. It’s the fuel that allows common people to attain and achieve uncommon results. At PICS, we truly believe that a vast majority of our success is the result of our team first culture. Every member of the PICS Team is assured that their best talents will be utilized to achieve our common goal of providing our business partners with the most accurate, professional, efficient and user-friendly solutions to their inventory needs. This crew was very professional and did an outstanding job. They were all very neatly dressed, conducted themselves in a very professional manner and counted very accurately. I think they are a great addition to too our company. One of the best and smoothest inventories I have been involved in over a twenty year period…great job. Smooth inventory scan, the crew did an awesome job. PICS has consistently provided efficient and accurate physical counts as well as excellent customer service. Feedback received from store Directors and Managers has been extremely positive with many commenting that they feel as though they have formed a true partnership with the PICS team. The transition to PICS was very smooth and has thus far been a rewarding partnership. We look forward to a long relationship and possibly expanded services. As usual they were great. It is nice to have a crew that is familiar with our store and inventory. They are always professional and friendly. I don’t dread inventory any more. I actually look forward to it because they make it a pleasant experience.